As with other components, I decided to make my own purflings. Partly because I wanted to try it, partly because it was cheaper but mostly because that way I had the control over the wood or rather what colors were being used for them. 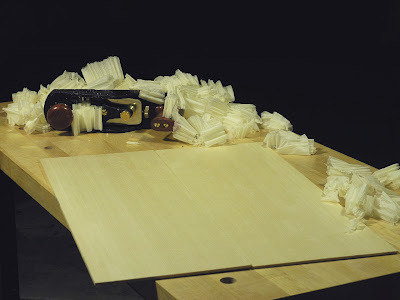 The ones you can buy ready made are mostly made from black and white dyed wood fiber veneers and I find them a bit harsh and cold in comparison to the warmer natural wood colors that are aesthetically more pleasing to me. The ones I made for this guitar are maple/bubinga/maple. A strip of rosewood veneer will be added later to the top purflings to give contrast between the maple veneer and the spruce top. 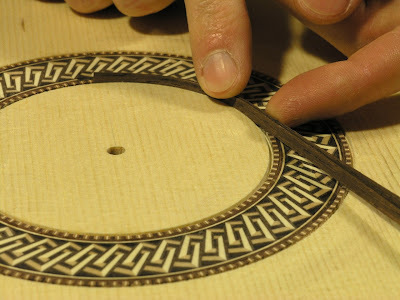 As with the veneers I prepared for the rosette and bindings, these were cut slowly with a sharp Stanley knife using many light passes in order to avoid the veneer splitting during the process. 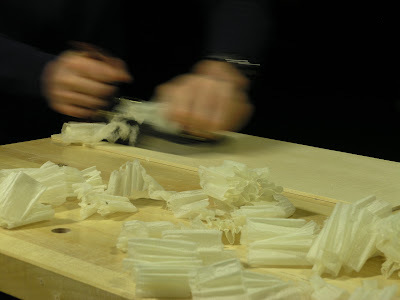 The veneers were then stacked and glued to a sandwich using an MDF clamping caul and wax paper. 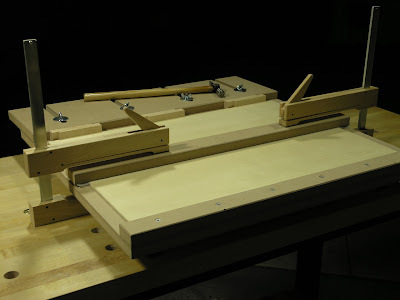 The many bar clamp used for this were attached and slowly tightened in the following order to minimize the veneers sliding out of place in the wet glue: First the end clamps were put on and tightened just until the glue started to grip then the middle one. Two more were added dividing the whole line up in four segments and last one clamp were added to each segment. Once the clamps were on they were tightened further in the same order. I used Titebond III for the gluing as it is more heat resistant than it's regular cousin allowing the purflings to be bent over a hot iron without disintegrating. 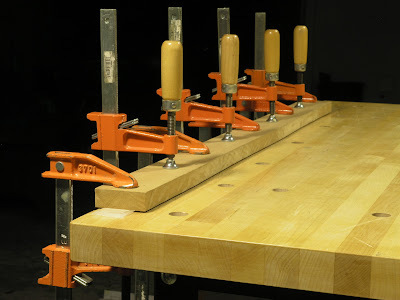 Once the glue had dried I clamped the sandwich in my shooting board and trued one edge and cut each purling to a width of 1/8" on my bandsaw, truing the edge again after each cut. I used Iturra Design's 1/2" 'Bladerunner' blade for the cutting and it worked great. 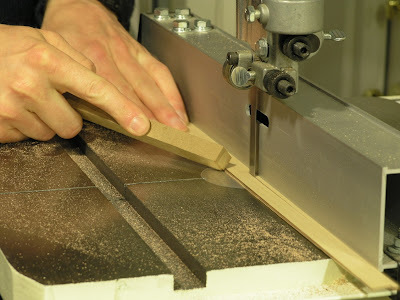 It has a very thin kerf just over 1/32" leaving very little waste. 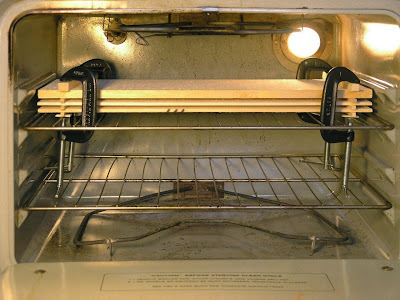 It allowed me to get six purlings from the 1" wide sandwich - two for the top, two for the back and one for the center back strip as well as a spare. 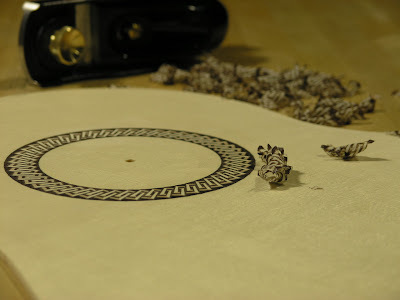 Over the past few days the border elements were installed to complete the work on the rosette. 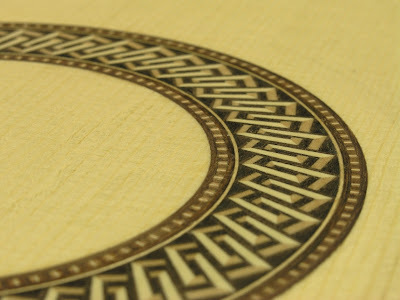 They were done in three installments working away from the central motif starting with the three inner maple/rosewood/rosewood veneer bands, the border motif and finishing the rosette off with two more outer veneer bands, both rosewood. This work did present itself with several challenges that I did not foresee. The tiles for the central motif were purposely made bigger (taller) and had flat tops and bottoms. 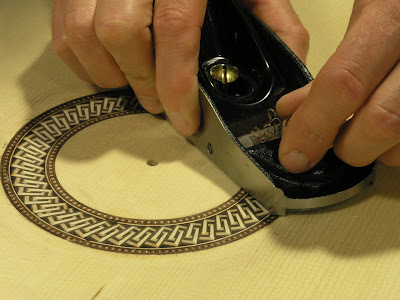 As I routed the first narrow channels to accommodate the inner veneer bands, the top and bottom of the central motif were trimmed to perfect circular curve in the same go. 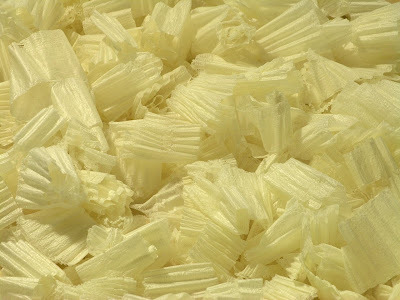 The bit used for this was a 1/32" solid carbide spiral downcut bit. The downcut bit really does cut down, packing the channel with sawdust to the extend that I had to route it three times while vacuuming, the clear it. I tried to start somewhere in the middle and then work my way out on both sides of the channel until the desired width was achieved. 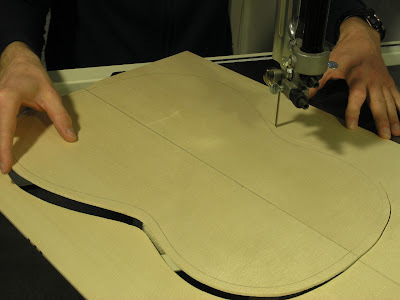 It was quite challenging to find the right width, and I had to use a loupe to my aid. I wanted a snug fit, however not so snug, it was impossible to fit the veneer strips swelled by the wet glue, but not so wide it would leave any gaps. and I struggled with estimating how much swelling to allow for. 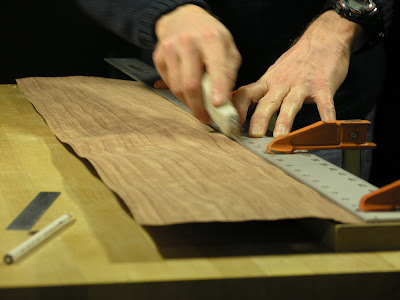 Once a dry fit proved wide enough to allow for a little play, the veneer bands were wetted with glue and glue was applied to the channel with a syringe. I lightly pressed the strips against each other and inserted the sandwich into the channel, press fitting them as deep as I could. It soon became apparent that I had routed both channels on the wide side. 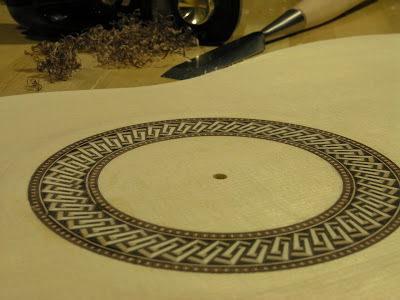 Particularly the inside one and I ended up having to improvise and quickly get some pin needles to hold the veneer bands butted up against central motif. 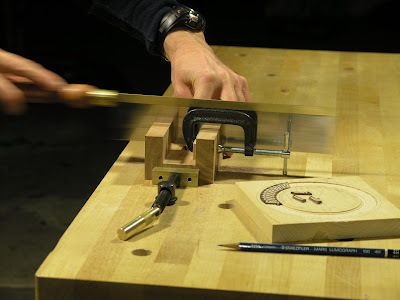 I left the whole thing to dry for about 30 minutes and then started trimming the protruding veneer, first with a chisel and then with a block plane, until flush with the soundboard. 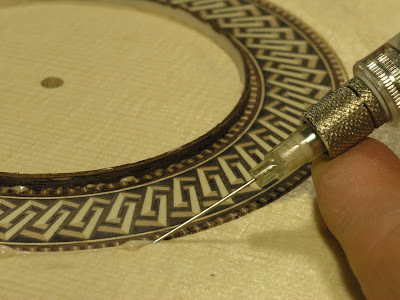 The wide channels had a ripple effect when it came to do route the channel for the border motif, as routing glue proved to be a very messy affair. I kept melting and quickly gunged up the bit. Cleaning up such a tiny bit was a very delicate and time consuming affair. After the first clean up I added some DriCote lubricant. which help a little on the consecutive cleanings and eventually I got it them both done and this time with a better fit. 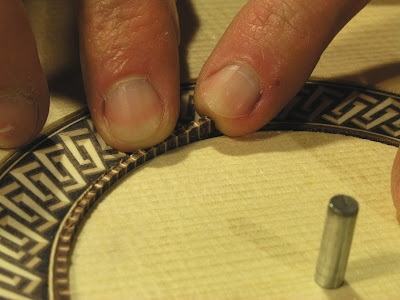 The inserted border motifs were clamped lightly for half an hour and then cut flush, as described above. 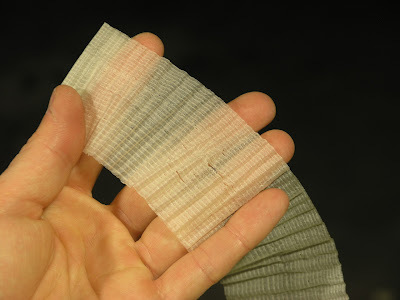 The out veneer bands were completed in a similarly manner to the inner veneers. One band segment went in smoothly with a nice tight fit, however the other one ended up too narrow. I guess I overcompensated. 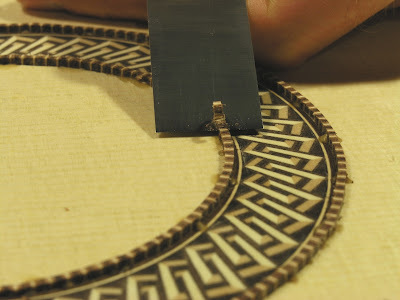 Once the glue was inserted into the channel and on the veneer strips, everything had swelled and it was impossible to get the bands to fit. I quickly had to clean up as much of the glue as possible, wait until the remaining glue had dried and start over again. Routing the channel the second time was not fun at all; Lots of bit cleaning. Over the weekend Installed the rosette tiles for the central rosette motif. This proved to be a bit more troublesome than it needed to be. I made a little miter box of some scrap of cherry I had lying about and then started cutting the tiles. I had put a little stop inside that miter box to get the tiles at an even thickness - 2mm. I numbered each tiles to facilitate installing them in a consecutive order. 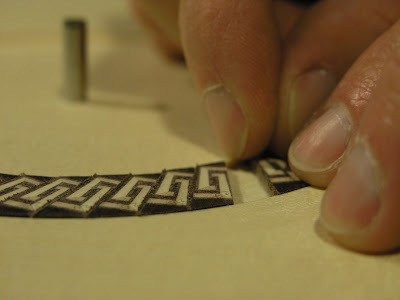 This jig was also used for the border motif, which were cut in the same manner, though only to thickness of 1.2mm. 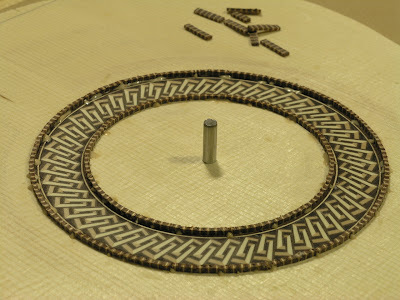 All the tiles were place in a mock up rosette channel I had routed in some construction grade pine scrap using my little Dremel tool fitted with StewMac's 1/8" solid carbide spiral downcut bit and their precision router base and circle cutter - a setup I found really nice to work with. The cuts were clean and precise. This little mock up not only allowed me to test the circle cutter but it also to try the fit of the tiles and make some final adjustments to the tile log - planing an ever so slightly larger taper into it. 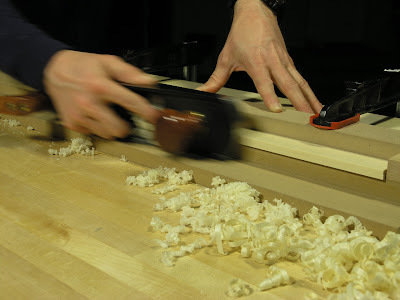 Then I set out to plane the soundboard to an even thickness of 3.5mm with my smoothing plane. 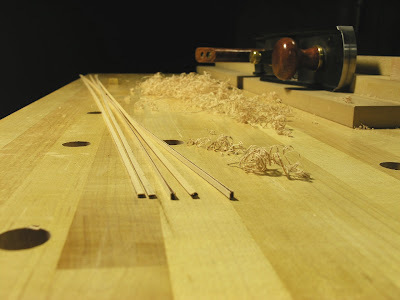 I didn't alternate with a regular and a toothed blades as Cumpiano suggest, neither did I follow his scheme of planing along, diagonal and across the grain, but resorted to just planing along the grain working my way slowly from one side to the other with slightly overlapping strokes, and it seemed to do the trick. 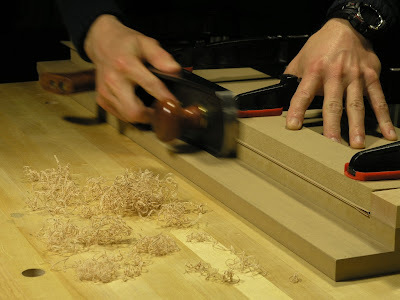 I measured often and planed areas selectively as needed if things got a little out of line. As I reached the targeted thickness a hidden knot emerged near the center seam, but I hope it will disappear, or at least diminish, once the soundboard is plane to final thickness. 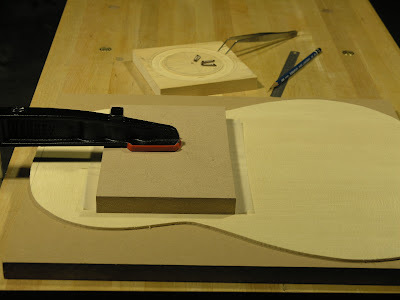 Furthermore, I was able to arrange the outline of the guitar so that it will be hidden by the bridge patch and thus not impair the structural integrity of the top. The outline of the body was drawn on the soundboard using the template and sawed out on my bandsaw leaving about 1/2" of waste. 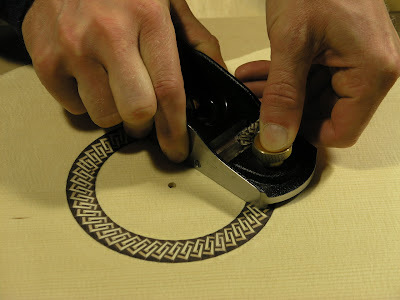 The position of the soundhole was also marked and a 3/16" hole was drilled for the circle cutter's center pin. Likewise a hole was cut in a piece of 3/4" MDF I used for support. 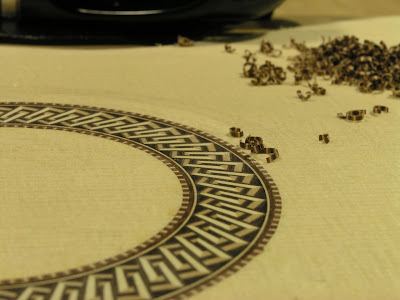 Like the mock up, the channel for the central motif was done with my little Dremel tool to a depth of 1.5mm but it was here things started to go a little haywire. 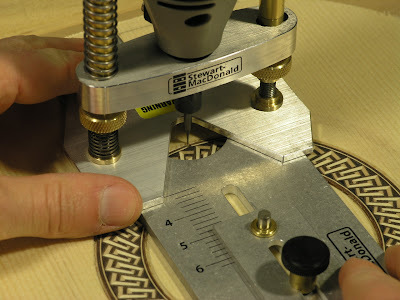 As the channel for the central motif was about 15mm wide, it had to be routed in consecutive steps. By the time I started the second circle I noticed that it was a bit deeper than the first. 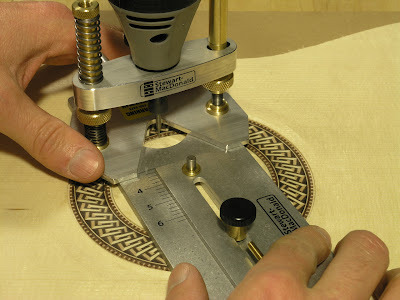 I attributed it to the fact that the router base was riding on top of dust accumulated during the routing. So I continued vacuuming carefully during the process. 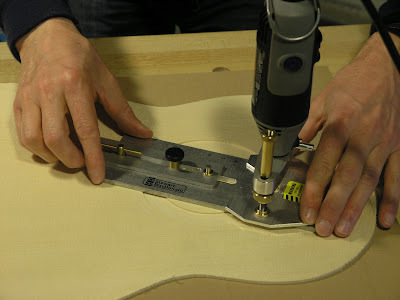 By the third round the cut was still deeper and it became apparent that something else was wrong and I found that the depth adjustment screws had come loose and was slowly lowering the tool as I was progressing. Luckily it was only gone down 0.1mm, but still. I reset the depth to 1.6 mm stared over again this time making sure everything was nice and tight. As I approached the edges I dry fitted a few tiles and continued to widen the channel until the tiles butted up against each other in a nice and snug fit. All the tiles were laid out in order ready to go, and a clamping caul and wax paper was cut. Everything was ready to go. It was getting close to dinner time and instead of leaving it until later I rushed ahead and filled the channel all the way around with glue and started to press the tiles in. For some strange and unknown reason I started on the side instead of the top, where the rosette will be covered by the fingerboard. I got a third of the way through when this suddenly dawned upon me and I quickly had to get all the tiles out again which proved to be quite tricky as most of them had started to set. In the end I was able to get most of the first ones out, and hereby moving the 'seam' between start and finish to somewhere under the finger board. I put in the rest, clamped them down and went into dinner only to find that half an hour later the glue had dried to a hardness that made it difficult to clean up. I don't know what I was thinking but thinking I wasn't. I cleaned up the glue the best I could and took a break and got my sons to bed and it was good to refresh my head. 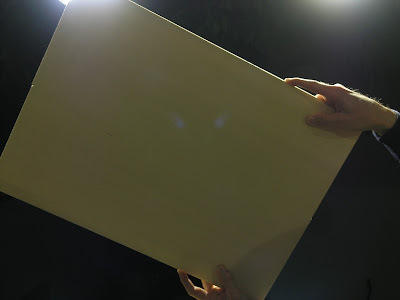 Once to boys were in bed and the dusk of the evening was settling, I got to do what proved to be a very rewarding task - planing the tiles flush to the soundboard. Shaving the thin slivers of end grain, patterned in all their glory, was a very gratifying experience and a very welcome change from the panic and despair a few hours earlier.